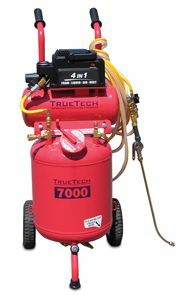 The TrueTech 7000 is a seven-gallon, portable 4-in-1 unit that can be used to treat a multitude of pest problems with foam, mist or spray. It is ideal for drywood treatments and under-slab termite treatments in addition to regular surface spraying. The compressor delivers 125 PSI of constant pressure, and can be used to charge other devices. Use it for larger pest jobs that requires larger volumes and pressure for treatment. The TrueTech 7000 also comes with a variety of application tips for multiple application purposes.